The story of Internazionale Domus begins in the late 1990s with the desire of three siblings to conserve their old family home on the third floor of the eighteenth-century Palazzo Pierret, aware and proud of having lived in a place that was unique, a building where even today we can breathe the charm of a family tradition that has been handed down from generation to generation from the 1800s to today. 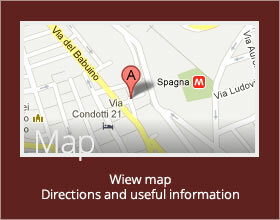 Internazionale Domus is located in Piazza di Spagna at No. 20 at the foot of the famous steps of Trinità dei Monti. 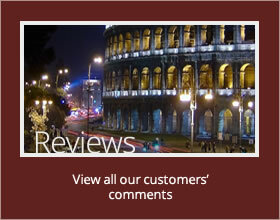 For famous writers and artists such as Keats, Shelley and Goethe, the square was a must-see destination during their adventurous travels in Italy. The story of the Micheli Gigotti family is linked to the old eighteenth-century palace since 1845, the year when Ernesto Pierret, an extremely famous goldsmith and engraver who was called on to create his works for many European royal houses, arrived in Piazza di Spagna. French-born, he transferred his exclusive business to the famous palace whose facade still bears his name. Pierret is the ancestor of the present Micheli Gigotti family who, since the first half of the 1900s, have lived in the building, enriching its rooms with artistic contributions starting with those of Lorenzo Gigotti, a famous twentieth-century painter, father of the current owners and husband of Anna Kambo, who was a direct descendant of Ernesto Pierret. The home of Lorenzo and Anna soon became a reference point for national and international culture. Very welcoming hosts, among the friends who attended their salon it would have been easy to meet very famous artists such as de Chirico, who also lived in the building, Chagall and Guttuso. Laura's sons, Carlo and Stefano Micheli Gigotti who were born and lived for many years in this historic home, who witnessed and participated in that "Dolce Vita" described by Federico Fellini in his extraordinary film, decided in the mid-‘90s to realize a dream: to redevelop this beloved building that they had been privileged enough to inherit. The efforts of the three siblings, an architect, a journalist and a lady of aristocratic origins, was that of creating a balanced mix of old and new at the service of an elite tourism in need of all comforts but also of art, culture and history. 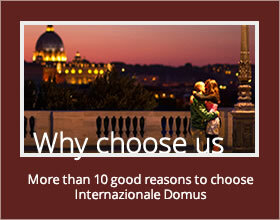 At International Domus the traveler feels in an unmistakable way all the strength of tradition and can enjoy the charm of the ancient frescoes that decorate the rooms and take in the panoramic views of extraordinary beauty. A few years ago, Laura, Carlo and Stefano passed on the baton to their children Daniele, Giulia and Elisabetta who, with great enthusiasm and a renewed entrepreneurial energy, manage the prestigious apartment hotel, which has become a centre of excellence in tourist Rome, with the intention of offering a welcome according to the canons of old-style hospitality. The Micheli Gigotti family welcomes you and invites its guests to indulge themselves with their gracious and refined hospitality. In an elegant and sophisticated atmosphere, you will be able to have an unforgettable experience. It will feel like a home away from home.